Iraqi politicians have agreed on a new prime minister, Adel Abdel Mahdi, to replace Haidar al-Abadi, after over four months of difficult work. Adel Abdel Mahdi is an experienced politician who almost became prime minister in the 2000s when Moqtada al-Sadr suddenly turned against him and, overnight, promoted Nuri al-Maliki for his first term in office. The choice of Abdel Mahdi comes despite the fact that, according to sources close to the Iranian General Qassem Soleimani, the US envoy Brett McGurk “did everything in his power to discourage Iraqi politicians, Sunni, Shia and Kurds, from adopting a candidate in harmony with Iran”. Up to this day, the Kurdish leader Masoud Barzani has not approved Barham Saleh for the presidency, a position allocated for Kurds (Speaker for Sunni and prime minister for Shia). The choice of Barham Saleh is contested by the many in the Talbani entourage and the Barzani clan who support Fouad Hussein for the Presidency. This office is the most vexing for all camps, including Iran and the US as they attempt to shape the new government. Barham Saleh has been promoted by Brett McGurk (during his last visit to the late Jalal Talabani’s wife) and by General Qassem Soleimani according to the source. Nevertheless, Iran and the Hezbollah envoy to Iraq are both trying to avoid upsetting Masoud Barzani. The relationship is complicated. Despite the presence of US intelligence HQ, a US base in Kurdistan, and the Israeli relationship with Iraqi Kurdistan, Iran still hopes for some influence with Barzani. This is why a marathon of negotiations is ongoing to convince the Kurdish leader to accept an important ministry, in return for accepting Barham Saleh as President, so that Iraq’s leadership may constitute a harmonious team accepted by all players. The future President will most likely be elected by the parliament, as was the case for the speaker, as happens when there is no previous agreement on one single name. There are seven candidates so far but only three are expected to enjoy support unless Barham is agreed upon at the last minute by all Kurds. Contrary to what US-linked politicians in Iraq maintain, Iran is not trying to impose on Iraq a candidate who is totally on its side and an enemy of the US. 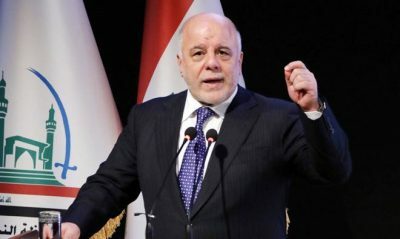 It did work against the US candidate Haidar Abadi. Soleimani and Hezbollah aimed to promote Adel Abdel Mahdi who is accepted by the Grand Ayatollah Ali Sistani, by Iraqi politicians (even if Nuri al-Maliki refused to support him until a couple of days ago), by Iran and by the US. “Officials from the United Nations, diplomats and many Iraqi politicians were carrying various indirect messages from the US to Soleimani in Iraq that the US is not aiming to cripple Iran from Mesopotamia but is willing to allow a smooth Iraqi government”, said a source within Soleimani’s inner circle. “were threatened by the US diplomats in Iraq to be scheduled on a blacklist, to halt all financial and humanitarian support and collaboration, to confiscate their wealth abroad or even to lift US protection from some provinces so the Shia of PMU can kill you all”. All this if they would not support Abadi or the list he was leading. Top US official in Iraq who asked anonymity denied the claim. The source close to Soleimani believes “the US envoy to Iraq has failed in his attempt to twist the Iraqi politicians’ arms and legs to promote a candidate hostile to Iran. Abadi placed all his cards in the US basket. That brought him down like a rock. He tried to pull Moqtada onto his side but he was left with his only ally Sayyed Ammar al-Hakim, the man who already choose the US-Gulf camp long ago”, said the source. Sayyed Moqtada al-Sadr took a hostile position against Qassem Soleimani even though he met him just after the parliamentary election results were reported. He has suffered from seeing his group – that he inherited from his late father – divided (Asaeb Ahl al-Haq, Kataeb Sayyed al-Shuhada’, Harakat al-Nujabaa and others) and financed by Iran. Nevertheless, he is not against Iran in favour of the US or any other country of the Middle Eastern region. Indeed, there are ongoing efforts and future plans to reconcile Moqtada with Iran soon, particularly after the beginning of US president Donald Trump’s full embargo on Iran next November. The situation in the Middle East requires that Iraqi politicians no longer be divided and rebuild the country stronger for the benefit of its regional allies. Iran’s aim was the selection of a new prime minister who enjoys good relationships with France and Europe and is accepted by the US. Abdel Mahdi is known to be faithful to his country and will maintain a balanced relationship between Iran and the USA. Abdel Mahdi is expected to ask the parliament to decide regarding the US unilateral sanctions on Iran, one of the main pending decisions that has prevented Abadi from winning a second term when he supported the US unilateral embargo against Iran. A few years ago, I spent an evening with the Vice President of Iraq Abdel Mahdi on a private occasion in Karbala on the 15thof Shaaban, in the presence of a very few top Iraqi politicians, including the late Sayyed Abdel Aziz al-Hakim. He was very critical of the way al-Maliki was running the government and said: “We are better off reopening our offices in Damascus because Iraqi politicians today don’t know how to rule but are good at playing the opposition”. “Al-Maliki called me asking for few billion dollars to be immediately under his disposal in forthcoming days at the latest. I told him it is impossible because I don’t have a bank with money to pull out a couple of billions for you, nor do I have a pocket big enough to contain this much money”, al-Issawi told me. When no further reasoning was possible, al-Issawi sought help from Adel Abdel Mahdi. Abdel Mahdi explained to al-Maliki the long procedure entailed in presenting an approved budget, not a matter of a few days or weeks. “Adel saved my life. Al-Maliki didn’t understand anything, I bet, but at least he is off my back now”, said Rafei. It looks like the US won’t finally put pressure on Iraq, and it is unlikely that Trump will impose sanctions on the Iraqi government in November in parallel with the Iran sanctions set to begin in November. Trump, or rather his team, don’t want to lose Iraq completely to Iran and thus is expected to allow Iran to trade with Iraq the trade exchange has reached $4bn 165 million for the first six months this year). This is already a weakness in Trump’s plans for sanctions!